This is really cool! I'm diggin' some of the playlist too. Faith No More? That takes me back. Can't say I approve of the poster hanging technique. I have Metallica posters from the mid eighties that I ruined by hanging them improperly. I feel so relaxed :O I love his expression. Great work! 10 and 12 are the only two bands i've heard of in that list. Dude, really-- See below. d.m.f. How so? Mike & I are both from Eureka, CA... He grew up in nearby McKinleyville (his family still lives there) and went to high school there. (I was at Eureka High.) I'm 2.3 years older than him (me: 47; he: about to turn 45). He used to work as a clerk at the local record shop, "The Works", as his day job, when Mr. Bungle was "just" a local band-- It was there I knew him best. He quit working there a couple weeks before heading to San Francisco to join FNM (I keep typing it "FTM" for some reason :P )... Haven't seen him since. Oh, hey, I just mean it's cool. I was into FNM way back. I also remember Mr. Bungle, and checking out some youtube clips I'm going to have to renew my acquaintance. I'm also a ska fan, especially Boston style (where I'm from) but also Operation Ivy, which is one of my favorite bands ever. Personally, the only sort-of famous person I've known is Amanda Palmer from the Dresden Dolls. She lived down the street growing up, and we went to school together elementary through high school. My teen years were spent listening to Brit-revival ska (early '80s, before American ska took off, especially English Beat, Madness, Bad Manners and Selector), new wave (ie: Elvis Costello) and Japanese technopop (today's J-pop is cutesy by comparison!)... In many ways, Mike & I were complete opposites, but we were amongst the few locally that even knew what ska WAS (and liked it! ), not to mention we both had exceptionally-diverse tastes in music. The most famous person- other than Mike- that I met was white blues-rocker Delbert McClinton, back in the mid-'90s, when he made a tour stop at The Works. Chances are you probably never heard of him. hey mindless self indulgence poster! Bearkin A!!! 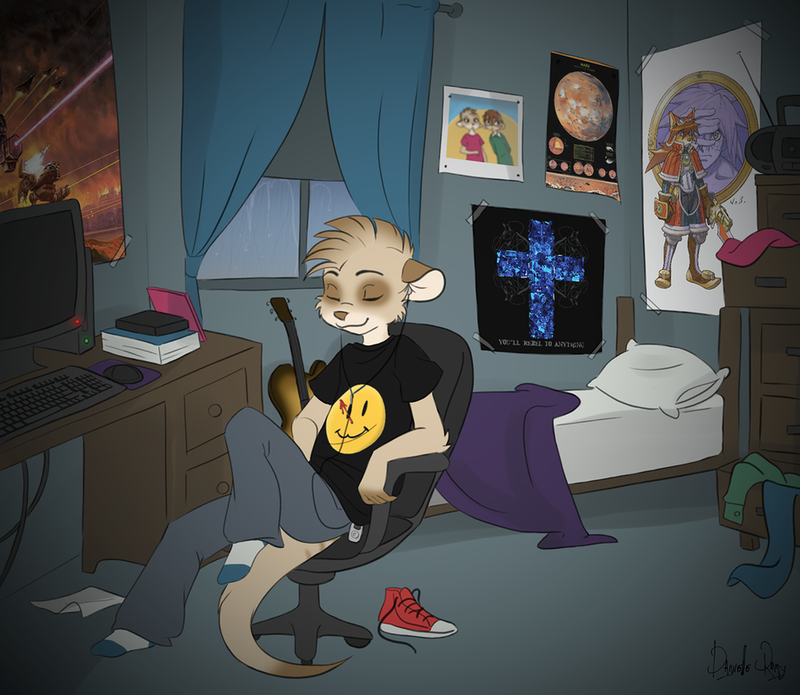 Awesome background work on this one and Edwin is just right on, nothin better to do on a rainy day then just chill out to the tunes. It's now time for reflection! And I'm listenin' by myself! Very cool! I like your design of the meerkat, instead of drawing a slightly altered version of Timon. I mean, I really like the Disney version too, but it's nice to see something different.